What fossils do we have? 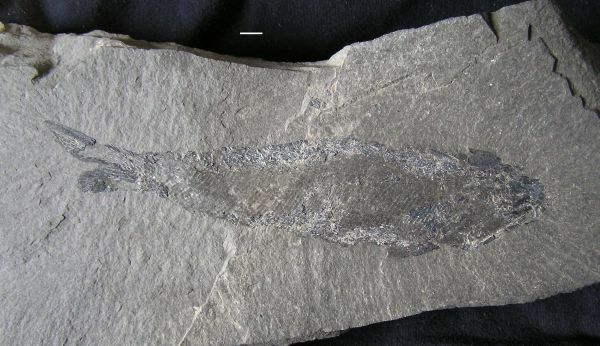 County Durham is best known in scientific circles for its fossil fish that lived in the Zechstein Sea in Permian times. 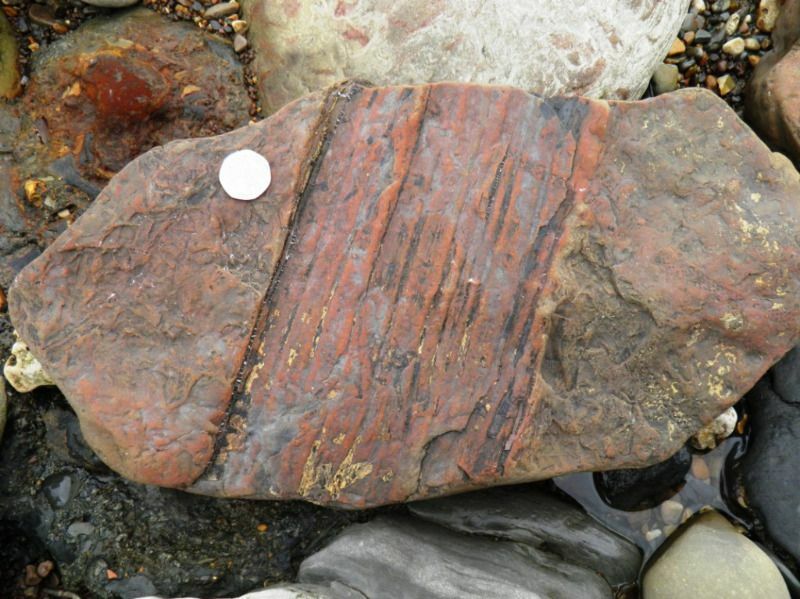 The fossils are found in the marl slate layers of the magnesian limestone area. There are specimens in many museum collections all over the world, and they can still occasionally be found today. 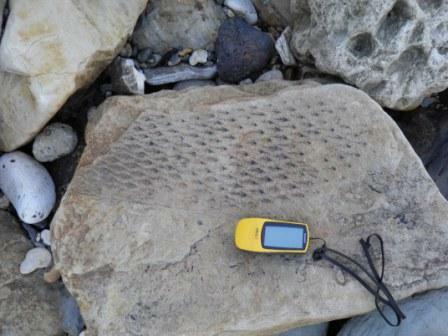 The magnesian limestone has other fossils, not as exciting as the fish, but far more numerous. 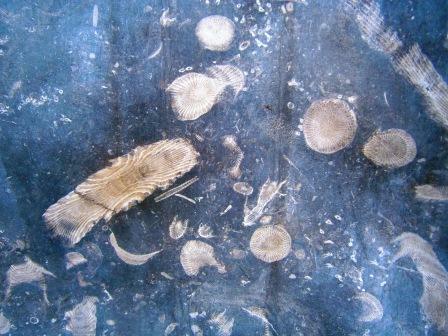 They are the remains of marine invertebrate animals that lived on a reef in the same Zechstein Sea. 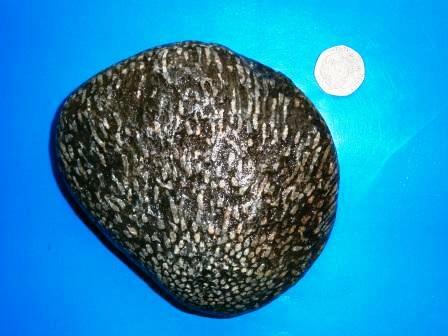 They are mainly Sea Lilies (crinoids), corals and bryozoans. 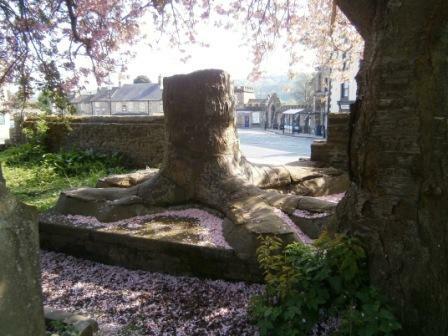 The two best known fossils in the county are in neighbouring villages in Weardale, the Frosterley Marble around Frosterley and the fossil tree in Stanhope churchyard. The fossil tree is one of the earliest trees, a Sigillaria, from the carboniferous period 320 million years ago. 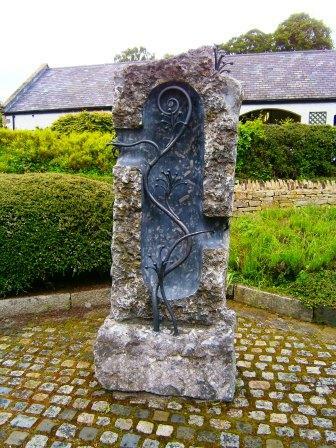 It was found in a stone quarry near Edmundbyers Cross in 1915 and brought to the churchyard, where it is a prominent feature of the town centre. There are other fossil trees, from more recent, post-glacial times, in the "Sunken Forest" off the coast of Hartlepool. The sea level rose after the last of the ice melted, drowning the forest. 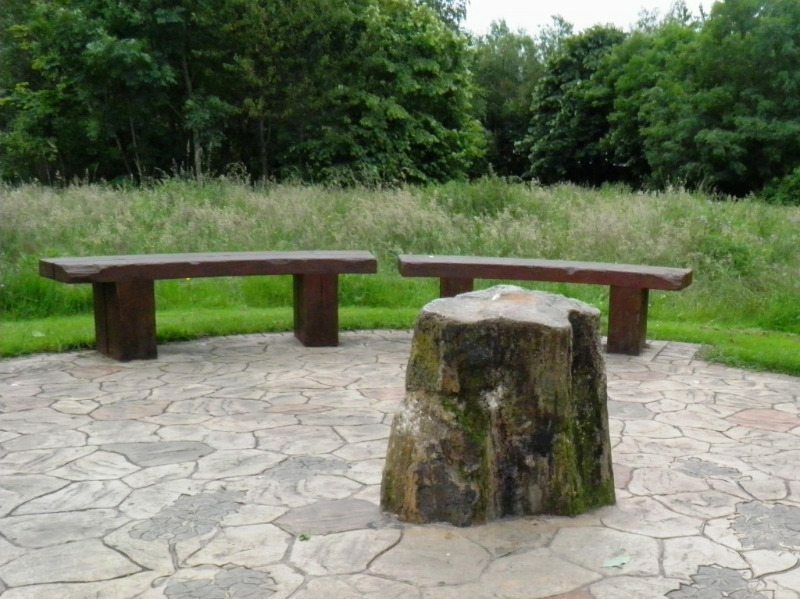 Tree stumps, branches, hazel nuts and leaves have been preserved there in a layer of peat. 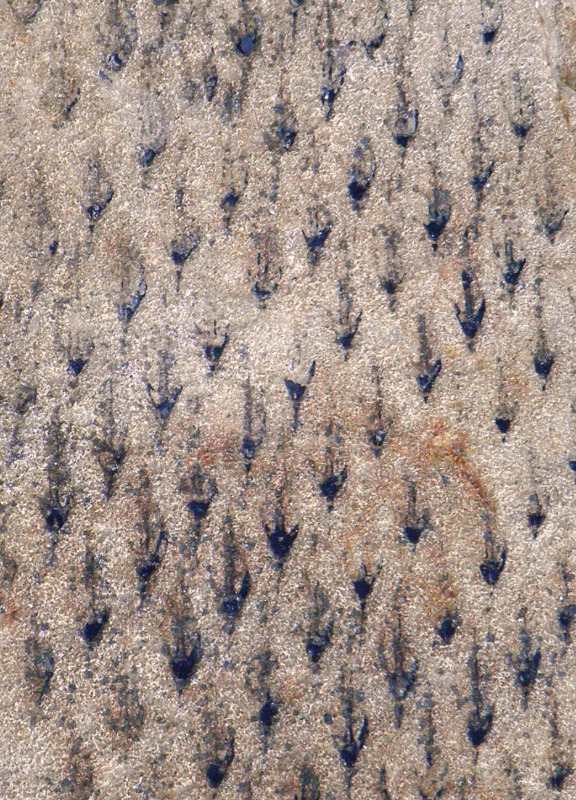 The forest is occasionally visible at very low tides, but is often hidden under layers of sand. The remains of animals from this period have sometimes been found when rivers and harbors have been dredged. These have included Red Deer antlers from Tyne Dock and Hartlepool, Irish Elk antlers from Neasham and South Shields, Aurochs from Tyne Dock and Woolly Rhinoceros from Brierton. 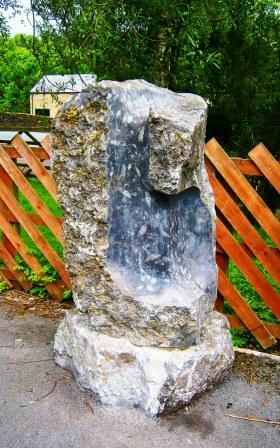 You can see the Frosterley Marble in several places around the village, including a sculpture at the railway station, a raw boulder at the village car park and many pebbles and cobbles in the River Wear. 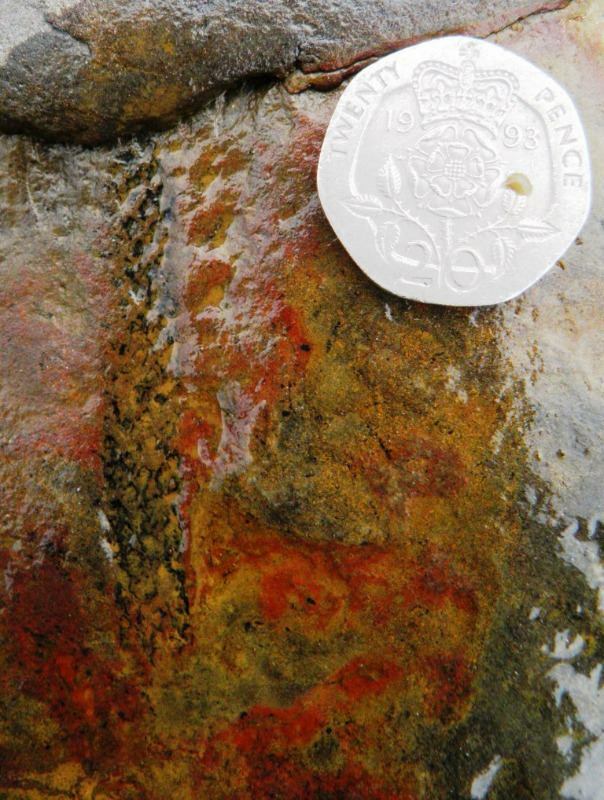 The best place, though is in the bed of the Bollihope Burn, under the footbridge at NZ019353, where the rock is naturally polished by the burn. 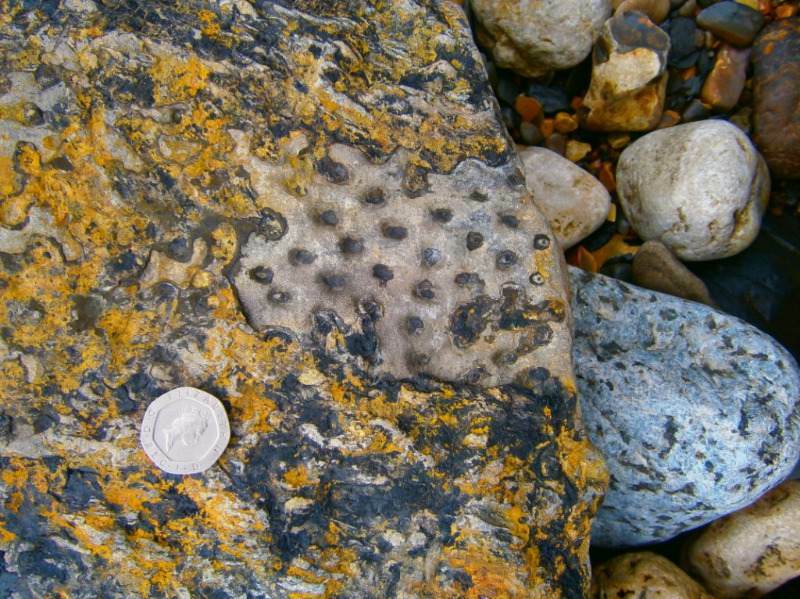 Teesdale also has its own special fossil limestone, the Egglestone Marble, which has crinoid fossils instead of corals. Like the Frosterley Marble, it has also been used for fonts and monuments. 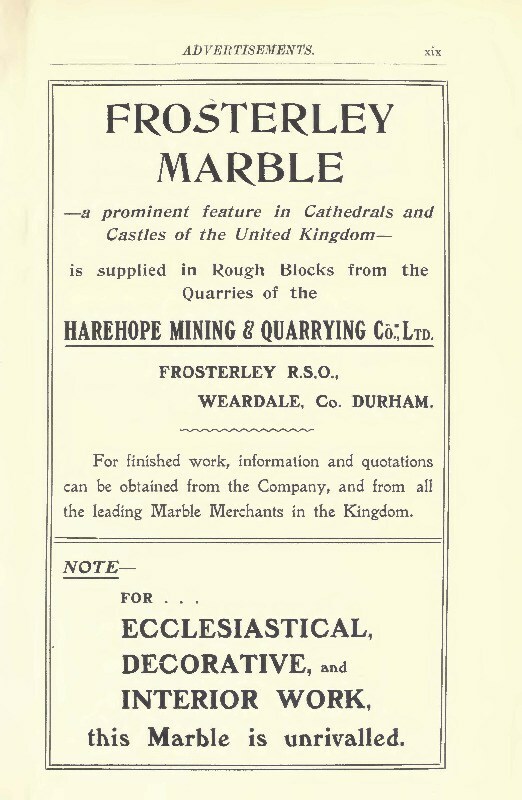 A list of public places where you can see the two Durham Marbles can be downloaded by clicking on the Frosterley Marble advert, above. There are also large numbers of gravestones and features in private houses, mostly hearths and fireplaces, not listed here. "Portable" objects such as clocks and paperweights can be bought from several websites. The coal measures have produced many fossils, found in the coal mines or in the waste rocks brought to the surface. 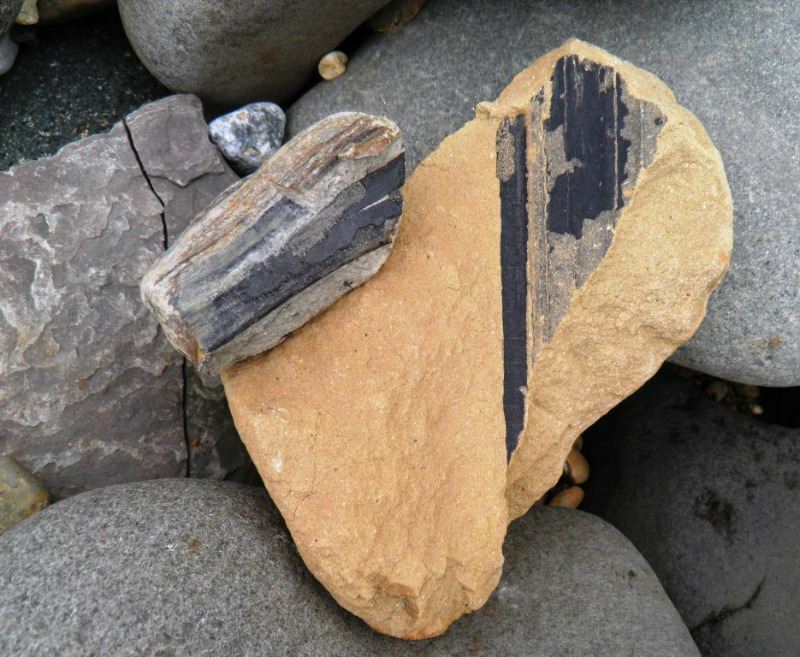 Some of the waste from the coastal collieries was tipped into the sea, and can still be found along the shore. The fossils from the coal measures are mainly leaf impressions, tree bark and other parts of trees. The picture shows a 50 cm part of the trunk of a Lepidodendron, on the shore at Chourdon Bay. The "snakeskin" markings are where leaves grew out of the trunk. 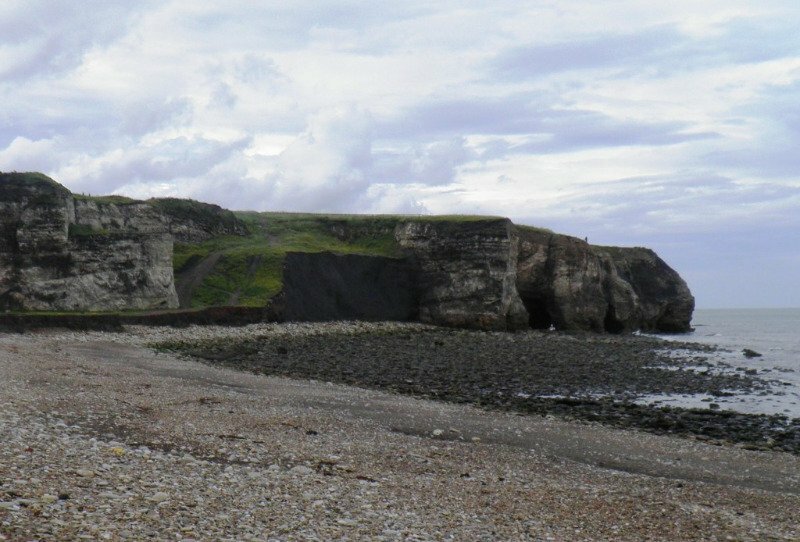 The coastal cliffs are magnesian limestone, and some coal measures rocks have been dumped at the coast in our industrial past. 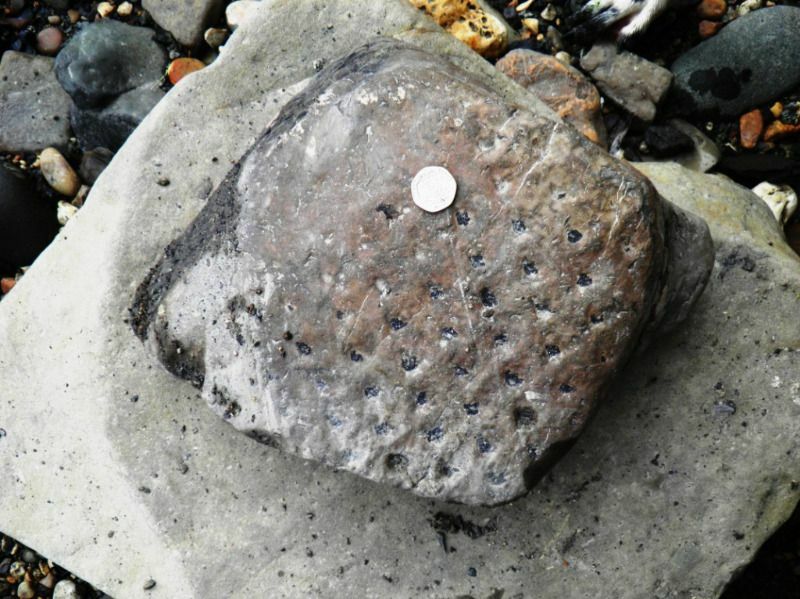 A mixture of Permian and Carboniferous fossils can be found here, including crinoids, corals, bryozoans and parts of coal measures trees. Seaham Hall beach and Chourdon Bay can be worthwhile.The northernmost part of Chourdon Bay, at Noses Point, NZ438478, has a good selection of fossil plants in sandstone boulders, shown in the gallery below. They are below the black "cliff" of coal waste in the centre of the picture. most easily found when the rivers are low but have recently been in flood. The Wear downstream of Wolsingham and the Tees at Winston and Whorlton can be good places to look. 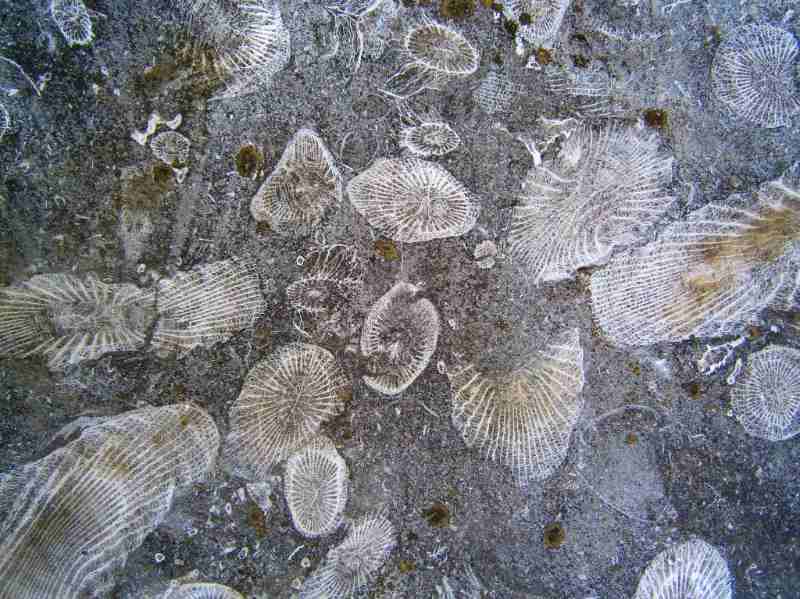 The group of fossils pictured are from Whorlton. 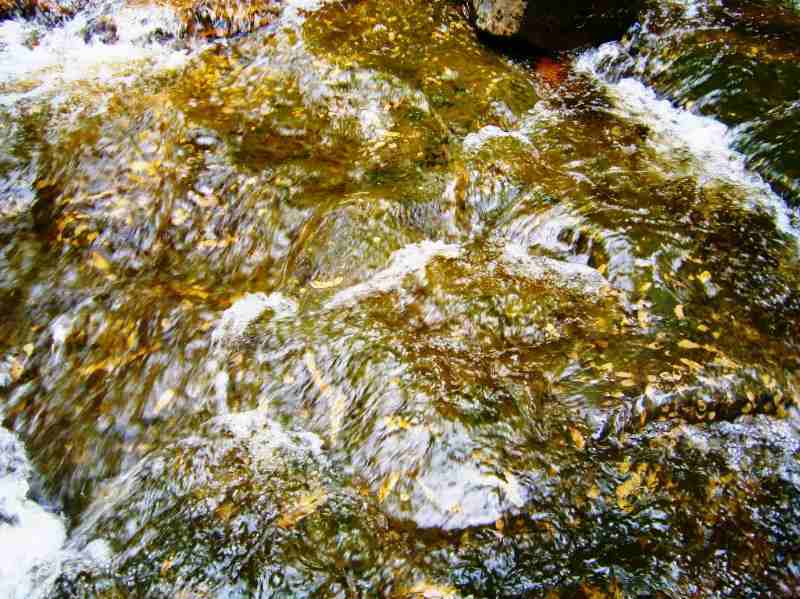 Smaller streams with rocky beds can also be productive, especially if they are liable to spate floods. 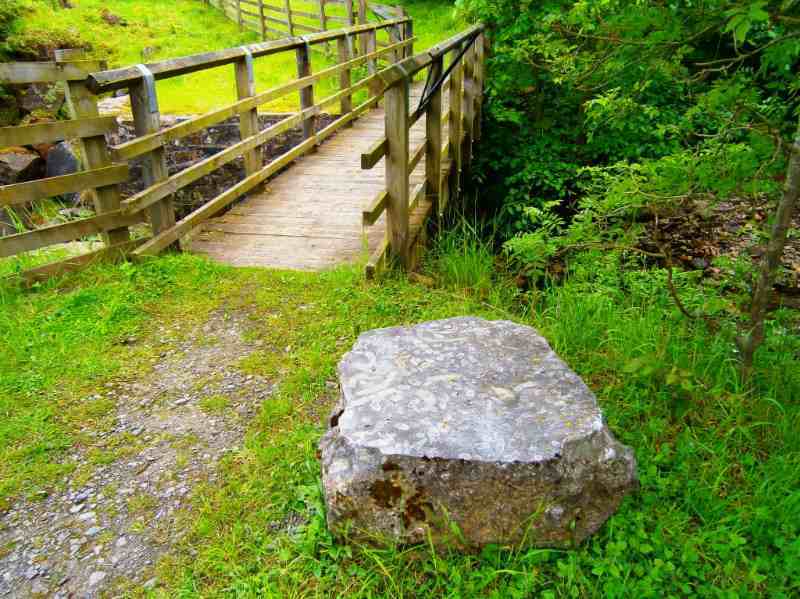 The Deepdale Beck, at Barnard Castle, is a good example of this. 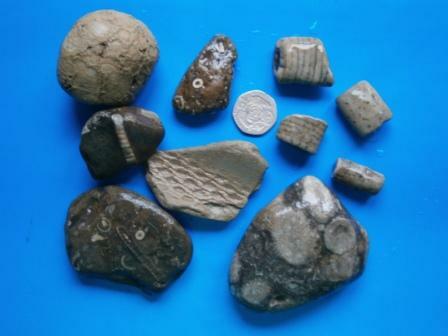 There are collections of fossils that you can see in the local museums, especially at the Great North Museum in Newcastle, the Sunderland Museum and at the Dorman Museum in Middlesbrough. They have websites- Great North Museum and Dorman Museum. 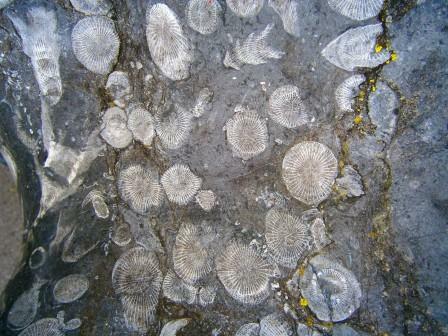 The Weardale Museum at Ireshopeburn has a collection of fossils and minerals found in the Weardale quarries and mines. There are many websites about fossils. 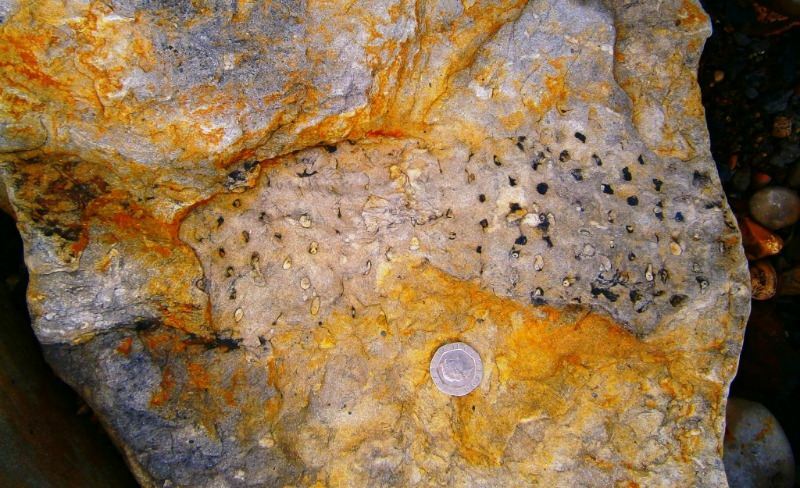 Two of the most useful are the Kentucky Geological Survey and Discovering Fossils.